So, that’s another IATEFL conference over. Like last year, I saw a lot of things, had some interesting discussions and have come away with a huge amount to think about. I gave a presentation of my own as well, which I’ll post on here soon, but for now I want to write about one thing in particular that has occupied my mind on the journey home. Why are these guys so well-known? What exactly is it they have done to achieve their high status? Who were the big names in ELT before them? If they have been famous for a long time, that means they became famous when they were relatively young. How come it was possible, say, 20-25 years ago, to become a “big name” in ELT in your 30s, but it seems to be more difficult nowadays? What’s going to happen after they retire? I think the first question is reasonably straightforward to answer. Apart from Raymond Murphy, whose big books are aimed at students, and Stephen Krashen, who is more of an applied linguist, they wrote books largely for people entering the profession or in the first few years of their careers, and so these books have had a lasting impression on ELT professionals around the world. Even the Murphy grammar books are often used by inexperienced teachers trying to work out what CCQs to ask their students when clarifying grammar. Their work has been inspirational and highly influential for many English language teachers, so it’s understandable that we look up to them for this. Their books and/or ideas also seem to have endured over a long period, so they have a similar level of influence over new teachers today as they did when I was starting out over 20 years ago. Most (though not all) of them have also managed to keep their profile up by continuing to tour the conference circuit, and by updating and revising their previous work. The second question is not one I can answer with any great authority; if anyone who is even older than me wants to correct what I’m saying I’ll be very grateful. I think though that there were quite a few “method gurus” like Gattegno (Silent Way), Asher (Total Physical Response) and Lozanov (Suggestopedia), who invented their own very prescriptive methods of language teaching. There seemed to be a lot of this in the old days; one person (usually a man) would come up with a method, and would often build a business around it. They sometimes even named it after themselves (e.g. the Berlitz method or the Callan method), and in the more successful cases these individuals were able to make large amounts of money. This concept of a single charismatic leader, with a way of teaching that their “followers” must all use, has always made me think of religious cults. Communicative Language Teaching (CLT) is a much broader church, which encompasses many of the methods mentioned above. It was within this new construct, which started to take off in the 1980s, that people like Harmer, Ur and (slightly later) Thornbury, Underhill and Scrivener made their names. Rather than promoting their own unique idea, books like Harmer’s The Practice of English Language Teaching (first published 1983) and Richards and Rogers’ Approaches and Methods in Language Teaching (first published 1986) offered us an overview of various ideas that could inform teaching practice. Others made their names through books that focused more on a specific aspect of ELT, such as Swan (Practical English Usage), Thornbury (About Language), Ur (Discussions That Work) and Underhill (Sound Foundations). What I’m trying to say is that, unlike their predecessors, these writers didn’t propose their own unique teaching method. They either presented a range of diverse ideas, or their own ideas but within a narrow area. It isn’t really possible to follow their ideas religiously because they don’t propose any particular doctrine (even Dogme is more of an attempt to get back to a purer form of CLT rather than anything particularly new). Still, these people have managed to achieve very high status in our profession, and are still the people that everyone wants to hear speaking at conferences. Maybe this is simply because they happened to write their books at a time when ELT was quickly becoming a global industry, and therefore an ever-increasing number of people have become interested in their work. And of course, as ELT was expanding, there was a lot of money to be made (by publishers) from the kind of teacher development books that they were writing. Did they just happen to be in the right place at the right time? It would be wrong to describe our current top TEFL celebrities as “gurus” in the same way that you might describe people like Lozanov, simply because they have never promoted themselves as such. And yet, there is a certain aura about them. It is unusual to see Jeremy Harmer at a conference just hanging about by himself; he is usually surrounded by a group of enthusiastic fans followers disciples groupies teachers, keen to know his opinion on whatever area of ELT they work in. If Scott Thornbury walks into an IATEFL session there’s a palpable frisson of excitement. If Jim Scrivener comes up with a new expression to describe a teaching technique, it will quickly find its way into the vocabularies of English teachers across the world. Of course, they are all good presenters who can command an audience well and make people believe that what they are saying is worth believing in. They don’t try to get us to become their disciples as such, but they have a lot of the key qualities that exist in charismatic leaders, meaning people are often seduced by whatever they say anyway. There’s no doubt that the big names in ELT deserve a huge amount of credit for what they have contributed to our profession. But at the end of the day, they are just men and (occasionally) women. It seems a bit odd that they should be held in such awe. Doesn’t it? Anyway, the fact that it’s still the same old people at the top of the status tree after all these years does raise some questions. Has nobody else got anything to say? Are they somehow clinging on to their status by touring the circuit and re-hashing their old books? Or, as someone from the floor suggested in Russell and Nicola’s talk, are they merely puppets of the publishing companies, who get wheeled out to promote products that will make these companies even more money? Whatever the case may be, the big names can’t go on forever. What will happen after they have gone? Sure, there are plenty of younger people in the business with plenty to say and lots of good points to make. Anthony Gaughan, Lindsay Clandfield, Willy Cardoso and Shelley Terrell are names that spring to my mind (only one woman? What does that say about me?). Maybe others spring to yours. However, it seems that writing a book that every English teacher and prospective English teacher will want to read is no longer an option for any would-be TEFL celebrity. The risk-averse publishers would rather produce a new edition of an old book than take a gamble on anyone new. Even coursebooks tend to be written by teams these days rather than individuals. Technology means that anyone can get people to read their ideas through a blog or website, and many people are building names for themselves in this way (Sandy Millin and Lizzie Pinard are good examples of this). The messages that are being conveyed may not be particularly varied or diverse, but the people conveying them are. It seems unlikely that anyone will ever again achieve the almost God-like status that has been afforded to our current, but ageing, stars. The age of the TEFL messiah seems to be nearing its end. And I should know, I’ve followed a few. This is something I thought about a couple of years aog, though in a less specific way. I looked at how we knew these “big names” in ELT and what got them there. Blogs and books quickly came to mind. The book will probably have to be in electronic format – surely paper books will be on their way out once the top 10 TEFLers have snuffed it? Thanks for this. The game certainly seems to have changed, and blogging is a way for pretty much anyone to get themselves a readership. Of course this is good for anyone who wants to have their ideas heard, but the levelling of the playing field also means that there’s a lot less to aspire to. I think a lot of people still hope to become the next Scott Thornbury, but I’m not so sure if there will ever be a next Scott Thornbury. I could be wrong of course. I was at the talk too as this is something my female colleagues and I have felt frustrated about in recent years. We’ve wondered the usual things – Is it lack of confidence among women or do men have an innate sense of confidence that we don’t have? Are female audiences to blame for putting men on a pedestal, preferring male to female speakers? A couple of years ago I expressed my worries about going to another country to do a talk to 200 university English teachers. A male colleague suggested I was already at a disadvantage as a woman as female-dominated audiences generally prefer a male speaker. I thought this was shocking when stated so explicitly. Anyway, it was great to hear Russell and Nicola (or should that be Nicola and Russell?!) raise the issue that it’s not easy for younger males to make a name for themselves in this industry either. That was something I hadn’t actually considered previously and it throws a whole new light on the topic. Thanks for exploring that further in this post. Hi Lindsay, and thanks very much for this. There are many issues surrounding the lack of women in high status positions in ELT, and the question of whether women prefer to listen to men is one of them. I have heard something similar being said about comedy, that women generally think that men are funnier than women (this isn’t my opinion, by the way, just something I heard somewhere – it might have been on that male-domiated comedy show QI). There could be some kind of connection here; a person capable of making a large room full of people laugh must have some similar qualities to a person capable of making a large room of people agree with their views on teaching. Does it go back to charismatic leadership? And if so, are men better at using their charisma to win people over? Or is it that women are less interested in having such status in the first place? There’s definitely a lot to explore in this area. Of course, my post focused more on age than on gender. It’s definitely not the case that you have to be over a certain age before anyone will take you seriously, as all of the top 10 were (I think) under 40 when they first became well-known in the profession. But they all happened to be around at a time when you could write a book about teaching and, if it was good, it could get published, and when a single book could propel you to the top. This is no longer the case. The landscape is different as people can and do get their information from a far wider range of sources than just a single printed book. This is bound to impact on the providers of the information as well. I think the issue involves all of those things you and I have mentioned to some degree, and more. I think that there is an issue with confidence, I think that a lot of women (and men) don’t feel the need to put themselves out there and I think there is the situation where women love to watch a charismatic man. You know how we love to idolise the lead singer of a band no matter what he looks like just cos he can dance around a bit. We could even call it the Poldark factor but hey, I don’t want to boost anyone’s ego that much and I’m certainly not keen on seeing any of those top 9 men scything grass with their tops off. On this occasion, as you say, key books written at a significant time in the industry just so happened to be written mostly by men (although the glass ceiling was no doubt lower at that time too) and they have endured because they are still relevant today. Clearly that will not be the case in future as teams of materials writers will work together much more anonymously. For anyone to make a name for themselves they will have to actively market themselves on Twitter, blogs etc. And we’ve seen in recent years that women have made a name for themselves in this way e.g Shelly Terrell etc. so that’s good news. It’s understandable you would find something stated so explicitly like that shocking – it literally is. I work at a school with 24 women and I think they would also be surprised to hear a man make that statement. For example: in your comment you say “is it possible men have more confidence than women?” You’re a woman and you can say that. If a man says “women are more confident than me” it’s not a problem. But if a man poses the same question as yours “is it possible men have more confidence than women?”, then women, to my experience, get on the defensive. How is the topic of gender division in the workplace ever supposed to make any progress when one half of the discussion (men) are limited to what they can and can’t say in order to not offend the other party in the discussion (women)? It all sounds a bit 19th century to me, the idea of trying not to offend women while have a discussion. Erm, so are you saying that in the 21st century you don’t think it should be necessary to consider whether or not what you say is offensive to women? Of course you should, which is why I wouldn’t say something like in the examples. I did Women Studies as part of my master’s degree and I spent a year in Poland trying to convince many people that empancipation still had a long way to go in Poland. What I’m asking is why is it OK for the women in my work place to say things like “all men are the same” (not talking about me but about other men in their lives)? Why is that sweeping statement justified, yet the reverse would be considered attracious, which it is and I would agree it is attrocious, but for some reason it is isn’t an attrocity when women say it. Why is that? Glad to hear you found the talk interesting. We’ve had a few negative comments recently that we were patronising and that Nicola seemed to be motivated by self-interest, so it’s good to hear that some people did actually enjoy it. I think most people did enjoy the talk. I’m surprised about the negative comments you received, when all you were doing was presenting some findings. Maybe what you presented made some people feel uncomfortable, but that’s not your fault. Your talk raised a number of issues that perhaps should be looked at more closely, and it’s important that people do this, so thank you. Something I’ve pondered on, too, as there are enough brilliant women out there. Perhaps they are too brilliant, i.e. too specialised in one particular field whereas the ones you mention are more generalists? Think of TBL, CLIL, bilingual education, primary language teaching, etc and you’re moving away from the generalists and into the specialists – where I can instantly name more women than men. Could that perhaps have anything to do with it? Hi Louise, and thanks for this. You make a good point about generalists vs. specialists. 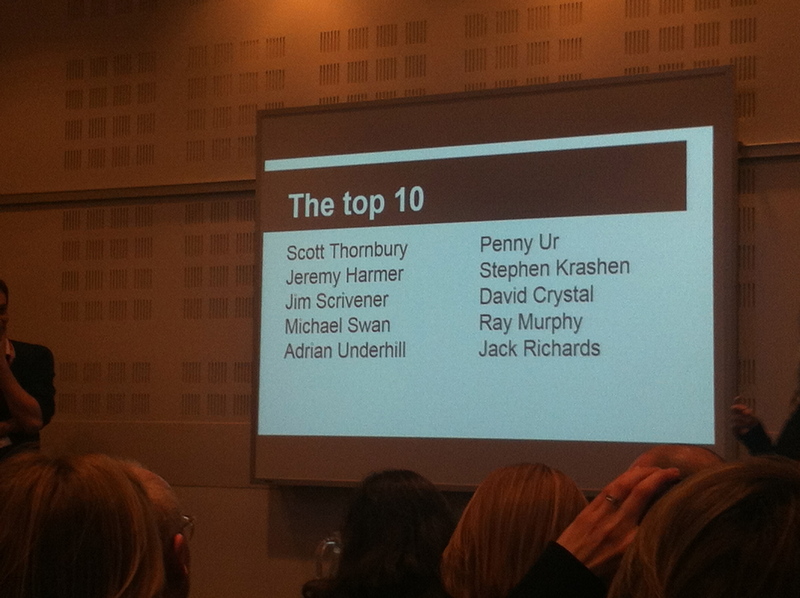 I think most people would agree that Jeremy Harmer and Jim Scrivener are the most successful generalists in ELT. They have both re-written their original books and because of this they have been able to hold their own across the decades. I wonder how much of this is due to them being men though? If Jane Willis had written “A Framework for English Language Teaching” instead of just focusing on TBL, might she be in a similar position to Jim Scrivener nowadays? I think a lot of it is to do with the publishing companies. They found themselves with a successful book that could be marketed to anyone entering the ELT profession, and they have done whatever they could to ensure that these books continue to sell. This includes sending the authors out on the conference circuit. I may be wrong though, I’m not quite sure where the power lies in the relationship between authors and publishers. I imagine most of it lies with the publishers. Can anyone confirm this? Unfortunately I didn’t make it to Nicola and Russ’s talk – mine was on immediately before and the room was already full by the time I got there. It was particularly frustrating as that was one of the ones I most wanted to see. Thank you very much for the mention of my blog. I think blogging has made a difference in terms of making women’s voices heard more publicly in our profession. When I think about the blogs I follow, over half of them are written by female teachers. I hope that as the ‘old hands’ of ELT start to make way, there will be more of a balance in those that replace them as the confidence we have found in blogging (hopefully!) transfers itself to speaking at conferences too. I’m looking forward to seeing how much the landscape shifts in the next 10-15 years as the big names move out of the profession – who will move in to fill the void they leave? Yes, it’s true that blogging seems to be a good way for a lot women to have their voices heard more in ELT. I wonder what the male-female ratio is for bloggers, in terms of number of blogs and readership? It may well be the case that women’s blogs are being read more than men’s. People have different reasons and motivations for writing a blog. Some want to make a name for themselves, others want to be agents of change, others want to be helpful, and then there are some who are just trying to work through some stuff. All of these are perfectly valid motivations and, thinking about it, we are all probably motivated to varying degrees by all of those factors. It’s certainly a different landscape from when I first started out in teaching, when you tended to get all your information from a small number of books. Now the same books are available but there’s also the huge amount of information that’s available online and surely this is becoming an increasingly common place for new teachers to go to get their CPD. Anyway, you write very well and your blog is rightly a very popular one, so please carry on! The phenomenon of English as a Global Language (as written about by David Crystal) supports this shift, leading to an assumption that linguistic imperialism through English is (or should be) diminishing.There are quite a few non-native bloggers out there (Vicky Saumell, Hana Ticha, Anna Loseva for example) but the top names still seem to be native speakers. This is another issue that needs to be explored more, so thanks for raising it here. Really interesting discussion, which, as a woman in EFL I particularly appreciate! Thanks all! The two things that really struck me here are firstly that the gurus mentioned became gurus because of something: at some point, they wrote or said things that were interesting and helpful for a lot of teachers. And I don’t think there is any reason why someone who really has good ideas, new perspectives, interesting insights shouldn’t get heard today. You might have to be rather determined, but the profession has grown and there are many more platforms and opportunities for self publicizing – for example blogging and tweeting. However, the downside of this is that because anybody can do it, there is loads and loads of mediocre and quite a lot of downright rubbish in the public domain. Truly original ideas and insights are rather rare and because there’s such a lot of bosh and drivel floating about, they can be harder to spot … although I suppose if something is good enough it should shine through! But because of our celebrity-obsessed culture, I suspect that there are people out there who are more driven by the idea of being heard than the fact they actually have something to say … So even if you don’t these days have to convince a publisher in order to get a platform, there’s more of danger that your voice will simply be drowned by all the background noise. But is it harder to be heard as a woman in any case? I’ve only got my own experience to rely on and as far as I can see, the answer is yes. Partly because women do tend to be less confident than men and also busier. (When I worked in publishing and tried to recruit female authors I found this to be the case as women still bear the brunt of house-keeping and childcare, etc. The simply have less time for self promotion and are not genetically programmed for it in the same way that men are). 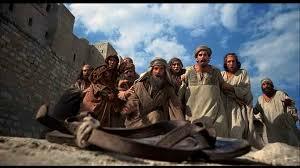 However, another obstacle is that men, especially a group of men, quite often don’t ‘hear’ women. In my experience, the problem isn’t men offending women, it’s dismissing them. I was once involved in a project with two of the people on the gurus list – and a third on younger gurus list – and I had enormous difficulty in getting any engagement, even when I called on my manager (also a woman) for help. She experienced similar difficulties – we might as well not have been in the room. I don’t know why this is, and, in many cases, I don’t think men are doing it on purpose or indeed even realize that they are doing it, but it’s a phenomenon that I believe exists and women still struggle with. When I work with a group of men I find I have to be really strong and insistent (taking care, which I’ve learned to do, not to be shrill or aggressive) when I voice an idea or an opinion, or it simply gets passed over. I hope the new generation of brilliant women in TEFL will be able to find ways of getting their brilliant ideas heard and appreciated. May it start here! I think everyone should be very careful not to make statements such as “(women) have less time for self promotion and are not genetically programmed for it in the same way that men are.” I find this offensive and highly dangerous. Genetic programming – really?! You know when people talk about exceptions? That’s because there is no rule. It’s interesting how many things get put down to genetics which later we look back on and realise we’re entirely cultural. I think you make some good points about the way women are perceived by men in a professional context. There are societal norms that need to be challenged, and feminist discourse aims to do this (though I’m not particularly well-read in this area and would appreciate any input from anyone who is). I think Holly is right though about genetic programming. This is a very strong claim and implies that nothing can be done about it. I would like to think that a lot can still be done to make the playing field more level for women. I’m a younger teacher, only in the field for a few years, taking care of my young family, and always without funds to go to conferences, etc. This article was super useful to me for its summary of what the cannon is, who The Voices of our field are, and just in general who everyone’s got their eye on. It’s kind of a list for my professional development. So thanks for that! Also interesting thoughts about the roles that women are (and aren’t) taking on in the field. Good, I’m glad you found the post useful. There are certainly a lot of sources of information out there for newer teachers, and plenty of opportunities to develop professionally through accessing texts online – far moreso than when I first started out, sitting in my flat in Ulaanbaatar with my battered copies of Harmer and Murphy, wondering how to create an information gap with 45 Mongolian teenagers. Nice post, Steve. These guys are only gurus if people accept them as such. Once one of them hasn’t bought their round the glamour fades quite fast. I think what is interesting in the environment that you and I work in (Central belt of Scotland) is that there are so many women who are important voices. The Harmers and Scriveners are now just legacy devices being milked by the publishers, like toner for fax machines. The most that can be said of them is that they collectors of best practice. Thornbury has some great ideas, but dogme was always an attempt that was going to fail. Why would a mad travelphobe’s ideas about film making be a good basis for language teaching? Von Trier also comes across as a bit of a misogynist. So, I think in some ways the women are doing just fine. I know that my two line managers (Carol Butters and Sarah Donno) do a great job. They don’t just run a great department but they also allow for a great variety of approaches. Those guys have to retire someday. Maybe next time you can co-present. Yes, legacy devices is a good term to use, though this legacy still seems to have a lot of influence. CELTA trainees are often still expected to buy a copy of Harmer or Scrivener’s book, for example. I’m not sure about your criticism of Dogme. You seem to be criticising the analogy more than the actual approach to teaching – is that right? If so, I agree, but that doesn’t mean Dogme ELT or Teaching Unplugged is a bad idea. It’s true that there are a lot of women who play very important roles within our context – surely more women than men in managerial/influential ESOL posts in Scotland? Mind you, closer examination might suggest otherwise. On a global level I was surprised at just how scarce women are in the key roles, according to Russ and Nicola’s research. That last line sounds cheekier than it was meant to be. Sorry! I’ve only just seen this and you’ve explored the issues raised more fully than we had time to do which is great! As soon as the video is available I’ve got plenty more to say! Thanks for commenting Nicola. You certainly did raise a lot of issues, which have provoked a lot of interesting discussion – here and elsewhere. The debate could go in various directions from here. It will be good to hear what else you have to say. Thanks again for the interesting presentation. Interesting read for a Friday and something which my colleagues and I have commented on in the past. I don’t know whether Nicola mentioned The Fair List during the talk but it’s worth checking them out. It was set up by Tessa Woodward and aims to encourage gender equality at UK ELT events – they might have even been around at IATEFL. I apologise in advance for a long post, but I rarely comment on a blog unless something grabs my attention and/or infuriates me – I’m afraid there was much in yours that I found to be infuriating. So, 60% of ELT practitioners are women but only a small minority of these women make it to high-profile, high-status positions. Obviously this is a travesty and something that needs to be addressed. Why should such a state of affairs be a travesty at all, much less an obvious one? You state this as if it were the kind of thing all ‘right-thinking’ people simply agree with – if you do think this, why would you – or anyone for that matter – think so? How many of the people on that list were privately educated? How many on that list were the first in their family to gain a university education and how many come from families where at least one parent or other close relative was also a teacher? How many on that list have spent most of their careers in a Western first world nation (Europe, North America, Australia and New Zealand) and how many have spent the majority of their careers in Latin America, Eastern Europe or Asia? For that matter, how many of those on the list have spent a good part of their careers divided between just the UK and Spain alone? And of course, as another commenter points out in the thread, how many on the list are NNESTs? Any one of those questions has far more relevance from both a professional pedagogical point of view as well as sociological one than whether that person’s underwear is more likely to consist of one rather than two items. I would like to ask you again – just what do you think this travesty is exactly? I rather think you need to make clear your case that there even is a gender bias problem before you fret over whether or not you are belittling it. By saying there is a gender bias, you are clearly supporting the view that men are positively discriminated as men, and women are negatively discriminated against as women. As for the suggestion that this is somehow related to different levels of confidence – where confidence must of course be understood to be a barely disguised euphemism for swaggering arrogance – am I the only one to find it weird that we talking about a lack of confidence amongst people who are teachers? Why are these guys so well-known? Of the 520 respondents from the 30+ countries to which they managed to distribute the survey, how many of those respondents were volunteers? Presumably all of them, so the entire sample was self-selecting. One reason why I know this is because I was one of the respondents, remember completing it and even vaguely remember one or two of the questions. So here’s the thing – of those 520 volunteers, how many do you think have met or even actually know Nicola and Russ directly or indirectly? I can’t say for certain, but I would assume a fair proportion of them. Even if that’s not the case, volunteers who responded to that survery would have been far from representative of the ELT profession as a whole – perhaps on the off-chance that Russ or Nicola see this comment, and if they asked these questions, they can let us know how many of the respondents have been in ELT for 5+ years and how many for 10+ years; how many have at least a DELTA and how many have an MA in a relevant field or higher qualification – oh, and, why not? How many respondents were male and how many female. I’m willing to bet that the majority who responded were aged 28 and over, have at least a DELTA and have been teaching at least 5 years and the majority 10 or more. All of which, I hope it is obvious, will prejudice the results of the most recognized names on their list. Who were the big names in ELT before them? / How come it was possible, say, 20-25 years ago, to become a “big name” in ELT in your 30s, but it seems to be more difficult nowadays? I’m actually a bit baffled by what is meant by a “big name” because it’s entirely relative to what a person’s (or conference goers) particular interests are. For instance, of the seven IATEFLs I have made it to I have never once been to see Jeremy Harmer because he has never spoken on a topic that has been of any interest to me. However, I have been to a number of other people’s on that list because they did – and two of those (I won’t say which) were awful beyond belief and bored me to tears. Similarly, there are people not on that list that I always try to make a point of seeing because they always have something interesting to say (and if such things interest you, I can think of five women among them off the top of my head immediately). Krashen is not ‘more of’ an applied linguist, but a Professor of linguistics; Jack C. Richards is likewise a renowned applied linguist and I begrudgingly have to admit that Crystal is something similar, though it’s hard to tell as he doesn’t appear to have had an original or interesting thought for what seems like forever – also his whole am-dram Gilbert and Sullivan shtick really gets on my nerves. Ur, Swan and Thornbury all also teach (or have taught) at universities, but (as far as I know) their focus is different from the research interests of Krashen, Crystal and Richards. Harmer, Underhill, Swan, Scrivener and Murphy then are teachers, teacher trainers and freelance authors. To talk about these people as “big names” is to miss the point about how diverse they are as a group – isn’t it more interesting that there appears to be a 50/50 split between authors who have come to ELT writing through teaching on the one hand and authors who are professional linguists and academics who have come to ELT teachers through popularizing their research? Again, the year of their birth and what they keep in their pants is the absolute least relevant or interesting thing about them. Joe Sarno: “Well, that’s not just crime. That’s the way of the world.”. Beautifully put! Mind you, I’d brace yourself for his response…. Beautifully put indeed – thanks very much. Your comment is very long though, so forgive me if I don’t go through each of your points one by one. I’ll try and address them more generally though, if that’s OK.
A lot of what seems to have irritated you is about the research itself. You point out several areas in which it is flawed, or potentially unreliable. That’s fair enough, and I don’t disagree with that. The whole question of what a “big name in ELT” is supposed to mean in the first place is indeed questionable. But don’t blame me – I didn’t do the research, remember. I just happened to attend a talk and it got me thinking about some stuff, which is what prompted me to write this post. Russ and Nicola did stress during the talk that they are not researchers, and are perfectly willing to accept flaws in their research methodology and how that calls into question some of the issues they were raising. If you think that I was presenting these research findings as evidence of some incontrovertible truths then you were mistaken – I can understand how this would have irritated you though. It’s true that the names on that top 10 list are diverse in terms of their backgrounds and the kinds of books they have written. But what they do have in common is that they are all well-known authors within the ELT profession, which was what Russ and Nicola wanted to raise. Another thing that they have in common is that they have been well-known authors within the ELT profession for quite some time, which is what I was trying to explore in my post. I think that this is interesting; if you don’t then fine, but you can’t criticise me for writing about something that I am interested in and you aren’t. OK, the research findings might be skewed somewhat to represent teachers with a certain level of experience and who happen to know Russ and/or Nicola. Then again, they might not (you don’t know this – you’re only guessing). But even if they are, they give a clearer picture of who people generally regard as “big names” in ELT than your counter-argument could possibly tell us. A “big name” is not the same as a person you want to see at a conference. Just because you have never seen Jeremy Harmer speaking at a conference, this does not stop him from being a big name in ELT. Just because you didn’t enjoy someone’s talk, this also does not diminish that person’s stature in more general terms. I find it odd that you criticise Russ and Nicola’s research for being biased, or skewed, or not fully representative, and then proceed with a line of argument that is so narrow and subjective that it could never be used as any kind of basis for establishing anything. You ask some interesting questions yourself about the backgrounds of the people on the top 10 list, all of which might be interesting to explore. But you seem to be using these questions to suggest that focusing on gender in ELT is unimportant, to the point of being irrelevant. Is that really what you think? Fair enough, we need to establish whether there actually is a gender bias in ELT before worrying about what needs to be done about it. But let’s assume that the stats produced by Russ and Nicola, though not exactly robust, provide us with some kind of indication of the situation. If, in a female-dominated profession, the majority of authors, conference speakers and, for want of a better word, celebrities, are men, this is surely something that needs to be addressed. The fact that there is an organisation called the Fair List (link above) whose sole purpose is to encourage more gender balance at ELT conferences, suggests that it’s not just me (or Nicola and Russ) who feel this way. If there is no gender bias in ELT then this means the majority of women in ELT are quite happy staying in low-level jobs and have no desire to write books or speak at conferences. Otherwise we would have a 60-40 split in favour of women in all areas of the profession. The fact that there’s an organisation campaigning for greater representation of women tells me that there are women out there who have felt discriminated against and who want to address the problem. In the Q and A at the end of Nicola and Russ’s presentation, it was mentioned that conference delegates often ask for male speakers, and when a conference is organised through a publishing company the publishers insist on sending male speakers. There’s clearly something going on here. Having said all of that, my post wasn’t really about the gender issue, it was more about the age issue. But, in the same way that I think it’s a travesty that a gender inequality (glass ceiling, pay inequality etc.) exists in the majority of industries, I think it’s a travesty that it exists in my own profession. OK, my response has been a bit longer than I originally intended. Thanks for giving a different perspective to the whole thing, and apologies for infuriating you in the first place. I’ll hold my hands up now and I say I might lack the experience in this area, but this seems to me the kind of unsubstantiated comment people make when they want to elicit a reaction (I know it’s not your comment but someone else’s). I cannot fathom why a publishing house, for example in the UK, where lots of women work would have a policy of sending only male speakers. (I says”lots of women” because everyone I know who works in publishing are women). She used this example to elicit an emotional reaction on the topic of gender. To me, that has nothing to do with gender – it’s racism. She also quickly went off topic when I told her that I, a white male from the west, in my first job teaching had to experience two incidents of male students going to the office and asking for a female teacher, because they would prefer it. That was in Germany – the land of equality. I didn’t assume they had some gender bias – I just thought they had a preference. A bit like once at the doctors, my medical situation required two people to be present in the room and I asked for the other to be a woman, as I preferred that. I’ve worked with two very strong feminists – two wonderful and very well-informed people – who on the topic of the recession explained how if women had been the bankers we wouldn’t have got into the financial crisis we were in, as women are not so risk-taking as men. This is their statement and they seem convinced it is backed up by research. I’ve flaunted the idea to others since and they seem to generally like it. Now, if we transfer this to the topic of your post, then it might suggest that fewer women have gone to the top because they havent taken enough risks. For the big names, those risks might have included writing a book or taking a risky step in their career or a job that didn’t seem quite kosher. The notion of women not being risky enough is probably then disliked by feminists, as it goes against women, right? Yet, in the example of economics it’s liked – how does that work? I don’t know how the big names got to where they are step by step and there is the chance they might have just walked down their career path risk free, which would totally defunct what I have just written and I accept that (it would probably also support Nick’s comment above that their backgrounds are far more decisive factors than their gender) but if I look at my own little career so far for comparison, then I’ve taken a couple of risks, including the 3 above (I’m currently working on two book projects with two others who are taking the risk to put in all that effort for potential zero return). I also happen to know several others who have taken similar risks and they include women. I think when people write posts and comments they try to make a concrete point – I seem to be more speaking aloud here, a stream of thoughts. Sorry about that, but I hope somewhere there in my babbling so there might a concrete-ish idea. Thanks for your response and apologies if my earlier comment came over as an attack on you as a person (it was absolutely not meant that way at all), but rather it was meant as a criticism of a particular idea about gender in that post. I also appreciate that gender wasn’t the main focus of your post, but it was nevertheless one addressed not only by Russell and Nicola (hence the title they gave their talk) but also by a number of other people in the discussion thread – e.g. Lindsay Warwick, Sandy Millin and The Sceptical Technologist. At risk of outstaying my welcome, I’ve responded to a couple of the points you have made that touch on the line from your original post which was what actually caught my attention and that I wanted to challenge: “Obviously this is a travesty and something that needs to be addressed” and which I see you have restated in your response (“this is surely something that needs to be addressed.”). But you seem to be using these questions to suggest that focusing on gender in ELT is unimportant, to the point of being irrelevant. Is that really what you think? If you’re asking me whether I think gender is irrelevant at all, then no I don’t think that – gender differences in aptitudes to SLA is a fascinating subject (one I wish I knew more about) for example. But if on the other hand, you’re asking about whether I think it’s irrelevant in regard to that list of keynote speakers, then yes it is absolutely what I think (and believe I’d been fairly unequivocal on that point). If there is no gender bias in ELT … we would have a 60-40 split in favour of women in all areas of the profession. With respect, this statement is as absurd as concluding that the pound coin in your pocket must be a counterfeit on the grounds that after tossing it ten times it came up 9 tails and only 1 head rather than 5 of each. To expect the split to be 60-40 is statistically unsound. Even with an inanimate object such as a pound coin, even tossing it a 100 times won’t guarantee a perfect 50-50 parity and you could still end up with a probability significantly biased towards tails more than heads. (You would of course eventually reach a 0.5 probability of getting tails and heads if you had a large enough number of coin tosses, say over 100,000 of them). But you are suggesting that the same principle can be applied not just to something as dynamic and complex as human beings, but even to a specific subset of human beings i.e. EFL teachers, writers and publishers – which is not only a finite set at any given time but also a set whose members are constantly changing in terms of overall size and composition. To attribute the lack of a 60-40 split to a negative bias against women succeeding in the profession might seem like common sense but is in fact wholly erroneous (or at least if there is a bias against women in the profession, this is definitely not what proves that). The fact that there is an organisation called the Fair List (link above) whose sole purpose is to encourage more gender balance at ELT conferences [and to campaign] for greater representation of women tells me that there are women out there who have felt discriminated against and who want to address the problem. The fact that the Fair List exists and that there are women who feel discriminated against is in no way proof that they are actually being discriminated against in more or less the same way as the existence of Far Right movements in Europe such as Golden Dawn or the BNP can in any way be considered proof that their members are experiencing discrimination from their governments in favour of migrants and their families. Let me be absolutely clear that I am not in any way comparing the Fair List to far right nutcases, but I am just using that to illustrate the point that the existence and popularity of something should not be taken as a measure of whether the beliefs if its members are valid or not. There can sometimes be smoke without fire as Umberto Eco once pointed out. If the goal of the Fair List really is as the website says “an annual award that celebrates excellence of gender balance in plenary speakers, presenters and speaker panels at ELT events, in the UK.” then it’s a meaningless enterprise because it’s one that doesn’t seem to understand how and why there is not now or indeed ever likely to be the kind of parity they are looking for. … it was mentioned that conference delegates often ask for male speakers, and when a conference is organised through a publishing company the publishers insist on sending male speakers. There’s clearly something going on here. This is hearsay at best and while I’m sure someone in the audience might well have actually said this, it’s demonstrably untrue – unless we’re talking about the Kingdom of Saudi Arabia where I imagine it has to be a male speaker (a lot or even perhaps all of the time) in which case it has nothing to do with a gender bias on the part of the publishers. Go to any talk or conference related to Primary ELT and look at the keynote speakers typically invited there and it immediately becomes obvious that this can’t be true, even if it sounds like it should be. Publishers also tend to send the authors of their books to conferences for promotional purposes so to say that they discriminate against women speakers in favour of men is to ignore the long list of women authors out there – Julie Moore, Ceri Jones, Antonia Clare, Rachael Roberts, Sue Kay, Leslie Ann Hendra, Annette Capel, Sarah Cunningham … I’m sure you get the picture. This was not meant to be so long (again) so apologies for that and also again, I really do hope you understand that it is the ideas and not the person that I am being critical of here. To finish up though, there is still no convincing proof that a gender bias in ELT so no travesty obvious or otherwise. Great post. But I have one question. Are these really big names in ELT? Or big names in “British” ELT? I think if you asked the same question at TESOL or Asia TEFL you might get quite a different list. When Russ and Nicola did their research they got responses from a fairly wide range of countries, though in the interview (link above) they acknowledged that it may perhaps be a bit skewed towards European countries. It’s true that other parts of the world may recognise other big names, but I don’t think it’s wrong to say that those names are pretty well-known on a global level. When I was working as a teacher trainer in Malaysia, Learning Teaching and/or The Practice of English Language Teaching were pretty much required reading for trainees, and Thornbury, Underhill etc. were also on the reading list. I also know that Jeremy Harmer and Jim Scrivener have spoken at conferences in South America in the last few years. I don’t know about the others. Based on your knowledge (which is probably better than mine), what other names would you expect to see if a similar survey was carried out in Asia or the Americas? Thanks Steve – yes, just to clarify, my impression (very subjective) was that this lists reflects what people trained in a “British” version of ELT, and probably CELTA / DELTA, rather than masters, might see as big names. So for example people in the US doing a masters might read H Douglas Brown as an introduction to TESOL, whereas someone in the UK doing a CELTA / DELTA might be more familiar with Jeremy Harmer. Likewise many teachers in the US might recognize Betty Azar rather than Raymond Murphy when it comes to grammar books. Perhaps I was surprised that names like David Nunan (who was at IATEFL), Henry Widdowson, and Braj Kachru were missing from the list. There are countless others. So yes, I agree that the people on the list are influential in some circles, but like Nikw211 above I am not convinced that this list represents the “big names in ELT” (whatever that may mean). It depends who you ask. So many good points here from Nik and you. I can answer the respondents one. I pushed that survey much wider than my immediate circles through any facebook group I could find that was related to TEFL, including the IATEFL page. I attempted to post on pages/groups in the US, Asia and Middle East but with less success. Twitter and retweets was the vehicle for the rest. I also sent it to a couple of editors I knew. However we did have people from about 30 different countries in total. The demographic as Nik guessed did fall mainly to people who’d been in the profession 5-10 years and had minimum CELTA or equivalent (but not all will have still been teachers). Also it was naturally restricted to people who use social media. So, yes, not fully representative AND we were very annoyed with ourselves when we realised we’d forgotten to ask the gender of the respondents! I think though, but Russ may not agree, that our survey mimics the way market research is often done and that it had a larger sample than many a piece of ELT research! That doesn’t make it scientific, nor conclusive but it does present some patterns that are in line with the experiences of a sample that is definable as above. Thanks, Nicola, for adding more detail about the research you did. I think we can all agree that the evidence you gathered is far from conclusive, but your findings do represent the views of a reasonably large group of people within the ELT profession. This allows a lot of questions to be raised, which is a good starting point for further research. Thanks for doing this. Just on the guru topic. I would have put Tricia Hedge up there. It’s a shame her handbook for initial teachers (‘Teaching and Learning in the Language Classroom’) isn’t given much attention compared to the Harmer one. I found your post really interesting. Actually, I wondered straight away about how many of the ELT books (theory and practice) I really value were written by women. I drew up a top 10 and there were 4 female authors in it: Hedge (aforementioned), Penny Ur (Grammar Activities), Caroline Graham (Jazz Chants), Jill Hadfield (Communication Games). Until I read your post I hadn’t given the ‘male dominance in ELT’ thing a thought, but I also hadn’t thought much about who actually wrote the books I use! I know, I hadn’t thought much about it either, and I was initially surprised that there should be a session exploring this. I didn’t participate in Russ and Nicola’s survey, and I can’t do it retrospectively because I know I would be skewing it, but I certainly like to think I would have put Tricia Hedge and Jane Willis in my top 10 as well as Penny Ur. Maybe Jill Hadfield too. But I can’t say for sure that I wouldn’t have just filled my top 10 with Scriverhillarmerbury-type names. thats true – if I hadn’t actually considered the books I use on a daily basis, and someone just asked me to list famous ELT people off the cuff, I probably would have only mentioned a lot more Thornbury types. Incidentally (just in relation to these gurus again) did you see the Harmer talk on testing at the IATEFL conference? I watched the recording. He’s great at holding an audience but I found it a little vague… I guess he only had 30 mins though. I agree that there has been some very interesting discussion here, and I really appreciate your part in it. I agree that there are sometimes contradictory statements from people who claim to be providing a feminist perspective. As I’ve said, I don’t really know that much in this area, but my understanding from my limited reading is that most feminist discourse these days follows the line that differences between men and women have been overstated, and that it is wrong to say “men are like this” or “women are like that”. Everyone is an individual with different talents, interests and needs, and everyone should be treated as such, irrespective of their gender. Attributing certain characteristics to certain people according to their gender is discriminatory, just like doing the same thing on the grounds of someone’s race. Arguments like the one from your colleagues about women bankers not causing the recession is therefore flawed. Having said that, we need to consider the fact that society (in the West at least) is largely dominated by (white) males, and this inevitably brings some hegemonic forces into play. To bemoan the lack of women in top banking jobs is to bemoan the lack of diversity in this profession and the narrow approach that this brings, and I think that’s fair enough. Can I just check something – are you saying that men are bigger risk-takers than women? And that this makes them more likely to cause recessions and also write ELT books? Or are you just putting this out as a line of argument? As an argument, it would not fit with the feminine discourse as I have defined it (which may be incorrect). But it’s a very fair point (which I’m pretty sure you ARE making) that there may well be other factors that have led to a majority of men making it to prominent positions in ELT, and these are also worth considering. I think that you could use feminist discourse to support this approach to the problem. I had not intended to reply to this blog, partly because I have already left some (occasionally) ill-informed comments on Facebook, which I have some regrets about. However on reading through the comments above I want to make two points and correct two glaring inaccuracies which I find personally offensive. Firstly (and despite some of the comments buzzing around) I commend Russ Mayne and Nicola Prentis (or vice versa) for bringing the issue of gender back to the table. They are not the only ones to do it, of course (cf the Fair List etc) but that doesn’t make their work any less important. Gender bias matters, really matters but/and there actually ARE a huge number of successful women in ELT. Secondly – and just to remind people – when I was Russ Mayne and Nicola Prentis’ age (ditto Thornbury, Scrivener etc) I thought I wouldn’t have a chance to shine in any way, especially since there were a whole lot of famous (mostly men, yes) names out there who didn’t look like they were going away. But that didn’t stop any of us doing what we did, because if your are passionate about something you get on with. And then if, perhaps, you get lucky (and luck has a lot to do with it) things go well for you. It was a different time then, and yes, publishing and writing is now in a state of flux, but passion & commitment (+ a healthy dose of luck) will shine through in the end. Right now in ELT there is a fantastic gang of younger presenters and writers who certainly inspire me, some whom are shooting upwards at an amazing and exciting speed. Fantastic. 1 Apparently any ‘name’ any of us on the list have is based on 1 book – work we did 20 years ago. Look at the extensive list of Thornbury’s books, for example, constantly, over the years. Or in my case? A bit of research would show (1983-2015) 4 different methodology books, constantly updated, two skills books, 3 readers, 4 adult courses, 2 teenage courses & decades of travelling around the world working with thousands and thousands of teachers on a committed and constant basis – plus teaching & training (to this day). I am not trying to show off or anything about this, but I think you will understand how this ‘work they did 20 years ago’ comment really got under my skin. Like Scott and Jim, for example, I have never stopped writing and travelling/working with teachers. And that’s what I continue to do now in a profession I care passionately about and am as engaged in and with as any of the commenters above. I try to make a rule not to write about ‘me, me’ in comments like this, but since I have no right to speak for Scott or Jim, for example, I guess I’m left to my own devices, hence all the excruciatingly personal stuff above. So then if people make comments about being vague or boring about my work I won’t like it, but that’s fine because it’s perfectly legitimate opinion. But when people start banging on about age or start making grossly inaccurate statements about legacy publishing, reputations based on work done 20 years ago etc, it most assuredly is not. Thanks very much for getting involved in this discussion – it’s great to have your perspective on the whole thing. Let’s start with something we agree on. I genuinely thought women were pretty well represented throughout the ELT profession until this year’s IATEFL conference. It was a good thing that Russ and Nicola did in highlighting some gender issues and the Fair List (which I hadn’t heard of until this year) is something that helps to raise awareness for conference organisers. I understand that you are an active supporter of the Fair List and I respect you for that. I respect you for a lot of things, and in my post I to mentioned the large contribution that you and the other “names” have made to the profession. Also, just for the record and to clear the air (in case you have assumed some things about me), the post I wrote has got nothing to with envy, bitterness or sour grapes. I am not sulking because you’re famous and I’m not. I am not an aspiring ELT author who thinks that you must have had it easy and it’s not fair that nobody will publish my stuff. There are probably lots of people out there who do feel this way, but I’m not one of them. I have no desire to be like you, largely because I appreciate just how hard you must work and, to be honest, touring the conference circuit is no lifestyle for someone bringing up kids. I’ve also had a lot of luck in ELT, and I’m perfectly happy with my above-average salary and my ridiculously long holidays, thank you very much. I’m not being sarcastic or trying to be funny, and I’m not trying to insult you either – I’m simply stating a fact. I didn’t say that, and I don’t think any of the commenters did either. I did say that you first made your name a while ago, and I mentioned one of your books by name. I maybe implied that you first became well-known for The Practice of English Language Teaching. But you did, didn’t you? I know that you’ve done lots of things since then, but The Practice of ELT was what you first became well-known for, and it’s still what you are best known for now, as far as I’m aware (please correct me if I’m wrong). I didn’t say this either – Ken did, and he has replied already. What I understood from his comment was this: Books that were written a long time ago lose their currency and therefore risk becoming obsolete. To avoid this, publishers choose to update these same books (which, granted, is a lot of work for you) rather than come up with something completely new. This is nothing against you – you write a book, they pay you, they ask you to update it, they pay you – you’re effectively doing your job. Not only are you doing your job, you’re trying your best to ensure that your books are as current as they can be. But it’s still about creating a new edition of the same book. Not a new book. That’s what I understood Ken’s point to be. I’m surprised that this post and the subsequent comments have offended you. That wasn’t my intention at all, and I was quite clear about that in the original post. I just think it’s interesting that the people who are widely regarded as the top names in ELT today were also widely regarded as the top names in ELT a long time ago, when I first started teaching. I don’t think it’s ageist to explore this issue. I’m not discriminating in favour of or against any age group – just exploring a phenomenon and raising some questions. It really isn’t personal. I really didn’t mean to make your blood boil, but I don’t think that my comments are absurd. There are reasons that publishers in any field (do we really need a 3rd THIRD Dido album?) stay with the product they have. ‘Legacy device’ was a wee post-modern (how I wish I hadn’t invented that) reference to a lovely book by Richard Powers called ‘Echo Makers’. Just to respond briefly to your second comment above. It seems that we only really disagree on one thing – I think that gender issues in ELT need to be explored, and inequalities need to be addressed, and you don’t. You appear unconvinced that there is any need to do this. Granted, the evidence provided by Russ and Nicola, and further comments from me, are easy to dispute, and that’s fair enough – I’m happy to accept that. But I don’t think that means there is no point in discussing it or exploring it further. You don’t have to, but I might. Recently Nigel Farage suggested we get rid of race discrimination legislation ‘because we don’t need it’. He said that the UK is not a racist country and therefore any legislation that protects minority groups is irrelevant. It would be awful if women in ELT were suffering discrimination and it was allowed to go on just because we all assumed that gender wasn’t an issue. there are terrible dangers in writing comments late at night as my little outburst above clearly demonstrates! Actually I liked your blogpost (Nick) a lot. I think the issues it raises (and that Nicola and Russ raised) are good ones. If I was now at the stage I was then (i.e. in my 30s, trying to teach and write and DO stuff), I would want to know the best ways of doing it too. But I’m not too worried about; as I keep saying, the talent of the young(er than me = most of them) teachers and materials writers and everyone else I see posting and presenting and generally being involved is awesome. Without that constant bubbling of engagement, passion and renewal I would have disengaged from the profession years ago and spent 100% of my my time doing music – which right now I have to squeeze in between the ELT life! There is no shortage of ‘younger’ talent and contribution, in other words; there never will be. I think, speaking at a normal time of day now (!) that the premise of some of this conversation which bubbled away in corridors, on Facebook and now here, got a bit obscured by the 20-year-old thing and then the legacy publishing thing which you said, Ken (not in Nick’s original blog). To many of us it DID sound as if we were being consigned to the past, and my comments were just a late-night shout to say ‘excuse me, we haven’t gone away and far from lying back and relying on something done years ago most of us are just as engaged and active as we always were. That’s it. And I probably over-reacted to something that wasn’t meant or said, in which case, sorry. But – and I do want to reiterate this – I am incredibly lucky to have written a book which is still used as a standard text. Still used. But if you look at the 2007 edition of that book it is embarrassingly out of date. That’s why it was incumbent on me to bring it to ‘now’, because even if it starts to fade in a reconfigured digital age it is still going to be relied on by some trainees for the foreseeable future so that I and the publishers have a responsibility to make sure it is as up to date as possible – hence the 2015 version. If people stop using it there will be no new editions! And I don’t see that as anything to do with legacy; it’s just about providing a tool which has to be as useful as possible, for a present age. A 3rd Dido album? I REALLY see a big difference between that and this. Just to clarify – I’m Steve, not Nick, and it’s my blog. I’m glad you liked my original post, despite the fact that it touched on certain areas that you took issue with. I think it’s pretty clear to everyone that you are still very active in the profession, and I agree that it’s much better to update your book than to just leave it as it was and still expect it to sell. Something that interests me about this (though it may be none of my business) is where decisions to do things like this come from. Would you contact the publishers and tell them you feel it’s time for a new edition, or do they tell you when they want to update it? (https://scottthornbury.wordpress.com/2015/04/26/p-is-for-power/) and this is something I’m very interested in at the moment. I’m of the opinion that publishing companies wield an awful lot of power in ELT, and they certainly seem to get a lot of the income. Maybe I’m wrong though. Anyway, thanks again for being involved in this discussion. There have been a lot of interesting comments here, which I’m grateful for. What a shame you misnamed the writer of the original blog post as my comment to you is all all about giving credit where credit is due. There is a reason why your book is still being used and that is because it is still useful. I think it is honest in its presentation: it makes no claims to be an academic text, rather a practical guide. Teachers and would be teachers do not pick up your boon looking for background to theory of learning or research. They pick it up because they need guidance on setting up tasks, giving instructions, how to talk about language etc. admittedly, the copy I have is not the most up to date and it has been many years since I had last looked at it but in a demonstration of what a new teacher might want some tips on I hunted for and found my copy of your book. Sure enough I was able to find the kind of practical advise that I, putting myself in the role of a new teacher, would benefit from. I think that we experienced teachers forget that things like classroom management did not always come naturally. And texts such as yours were of enormous benefit to us. We may feel that we have grown out of them but that does not take away from their value. Yes, I wish it had been Jemima Harmer and Julie scrivener who had written these introductory texts. Do we need new versions written? I don’t know – I don’t think so. I think it more likely that future new teachers will find the guidance they need in a completely different way – Google your problem and you’ll have a whole community giving you advice and support. As someone who did their diploma last century, I am grateful for the guidance I found in the practice of English language teaching and learning teaching. As someone still teaching and training in 2015 I admit I rarely feel the need or inclination to buy or pick up a book on teaching. There are so many other sources of up to date input. What a gracious response. I’m sure Steve would agree. Anyway, I just wanted to say that I still recommend your book(s) to trainees, happy that they are full of good sense. Personally, I think the later editions (of all these types of books) have started to sprawl to an extent that they are of less help to teachers just starting out. Dido was a bit low. Maybe one of those albums that Willie Nelson knocks off when he needs a few bob. That’s a bigger compliment than you might realise. I don’t know how to apologise for not calling you by your name Steve. I am SO sorry. I think I may just crawl into the forest, dig a hole and crawl in. I Liked you blog post STEVE, and thought it raised a whole lot of issues etc – see my earlier more temperate comments. Can’t do much about my gender Holly (or rather I’m to minded to!) but actually I think your point about people not actually needing methodology books (for example) any more cause they can look elsewhere for info or talk to their PLNs etc is a challenging one and you may well be right. It both encourages me (as a member of the community) and makes me uneasy (as a writer)! Though see http://www.washingtonpost.com/local/why-digital-natives-prefer-reading-in-print-yes-you-read-that-right/2015/02/22/8596ca86-b871-11e4-9423-f3d0a1ec335c_story.html We live in ‘interesting’ times. Anyway, time for me to stop sounding off. Once again, Steve, I’m profoundly sorry for miscalling you, and profoundly grateful that you write blog posts like this.